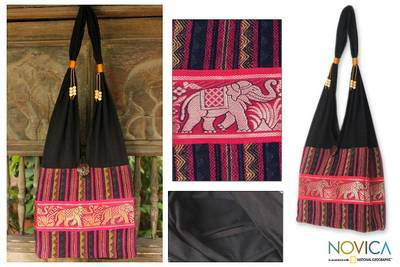 Handmade Cotton Striped Shoulder Bag , "Elephant Salute"
Detailed in pink and golden brocade, a parade of elephants salutes in the design of this shoulder bag. By Jiap Rojjana, the cotton blend bag features a colorful panel woven on a traditional loom by Karen hill tribe weavers in northern Thailand. Underscored by black shoulder straps adorned with rain tree wood beads, the bag has an internal pocket and closes with a coconut shell button. 90% cotton, 10% polyester, coconut shell, rain tree wood. Cotton lining.